The latest addition to our hire inventory is the Allen and Heath GLD-112 Digital Mixing Surface. 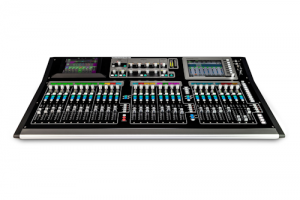 This system provides control for up to 48 inputs from a very intuitive control surface. The system is packed with features – satisfying the needs of the most discerning of live sound engineers. Our standard rental package consists of the GLD-112 control surface, a 32 input, 16 output stagebox and an 80m tour-grade ethernet cable system. This system is also compatible with the QU series of desks. Hire prices start from only £110 per day for the package. Contact a member of our hire team for further information.